Studio Notes: I'm In! Countryside Online Art Exhhibit! I'm In! Countryside Online Art Exhhibit! My very first online art competition, and I'm in! 140 artists from all over the world entered 455 pieces this show, "Countryside", curated by the online gallery Light Space and Time. 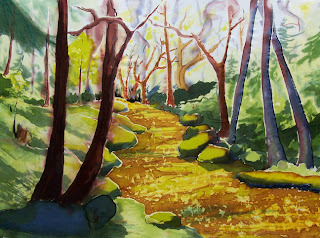 "Golden Pathway was one of 80 selected in the category "painting and other". 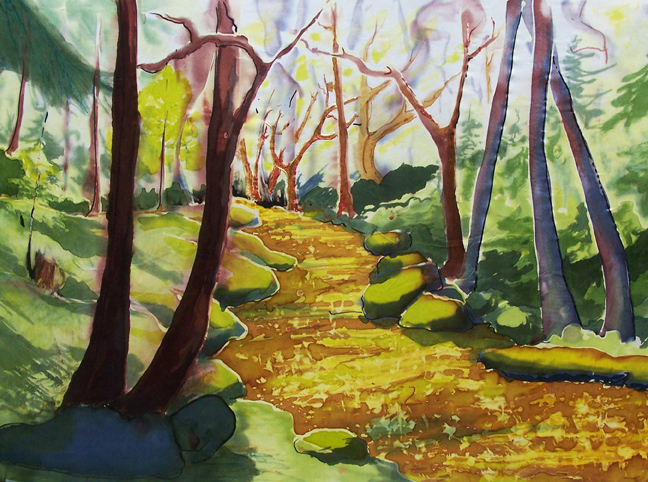 "Golden Pathway" is one of my favorite pieces, inspired by a summer walk with my beloved in a magical madrona forest on D'Çourcy Island in BC. It was a time of complete love, sailing in the sun, being exactly where I wanted to be. When my beloved died before the following summer, this image helped carry me through the grief. It has come to represent doing the work I am meant to do and that I love, being where I want to be, and being loved and in love. May you experience walking the Golden Pathway in your life! Archival art prints and cards of this image are available in my etsy shop. I Am So in Love with Alder Leaves!